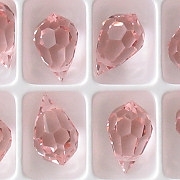 15mm (from top to bottom) cut crystal teardrops. 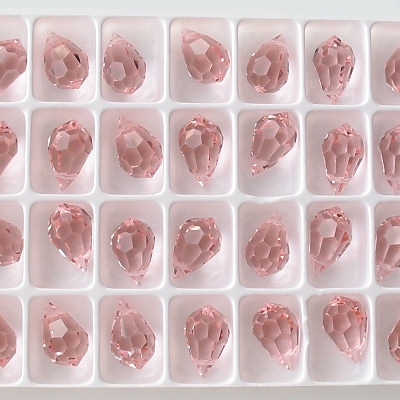 These are cut crystal beads, not fire-polished beads. The beads appear to be in good shape. These are the first cut crystal beads I have ever purchased. 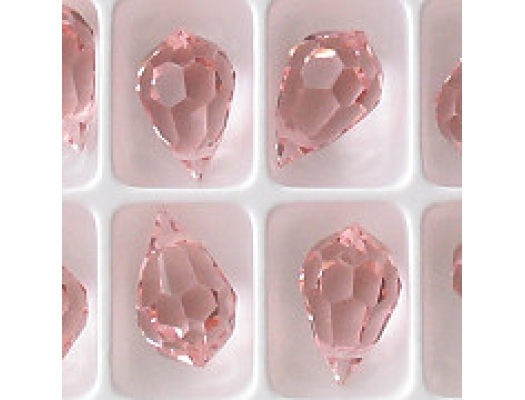 They are Preciosa beads (the Czech version of Swarovski beads). I don't purchase Swarovski beads, so I can't compare the two, but these look very good to me. Regarding the price, I have no idea if my price is good or not. I bought these beads from one of the suppliers that I get other Czech beads from, and I don't know if their price is good. Carrying these beads is a bit of an experiment. If they sell, I'll get more. Regarding the picture, I decided to leave them in their little plastic tray because the tray separates them very nicely. Preciosa cut crystal beads are made from leaded glass, but I don't think they pose any kind of risk. Since I removed the review feature from the site, I am conveying here the comments of a customer. She said that, compared to Swarovski drops, these drops have the same satisfying heaviness, but do not have the "prismatic sparkle" that Swarovski drops have (though she said she would continue to use them because they are so much cheaper). Also, she said that the holes are too far down (and too straight) to be used with a jump ring. Thus, you'll need to take a flat wire, thread it through the hole, and bend it upward to form your own ring. Now that I've gotten feedback from a customer, I'll look into buying these drops in more colors. Note: When I restocked these beads two years later, the supplier's price had gone up, so I had to raise my own price.